"I was terrified. I packed a backpack full of clothes, went to the hospital as he’d instructed, and had transfusions through the night to allow me to take a flight home at 7am the next day. I Googled acute leukemia as I lay in my hospital bed, learning that if it hadn’t been caught, I’d have died within weeks. "I have a couple more months of chemo to go, then the next step is a bone marrow transplant. 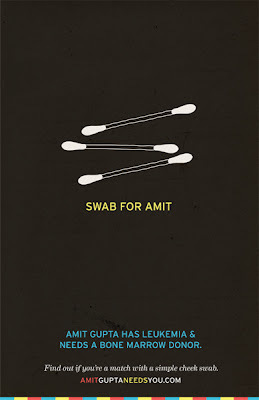 South Asians are severely under-represented in the bone marrow pool, and I need help." What does this have to do with Ann Arbor? There's a bone marrow donation registry drive coming up on Friday, November 4, from 2 to 8 PM on the Diag. Clearly I am writing this because I want my friend to live. But keep in mind that you're helping anyone who needs a bone marrow transplant. Learn more about all of this, from Amit to the donation process, by visiting Amit Gupta Needs You! Everyone should go to this! It's free and for just swabbing a cotton swab against your cheek you could start saving someone's life. That? Is pretty rad. Amit is probably the nicest guy on the planet. He'd do it for you!